In the week-to-week world of mixed martial arts, it's easy to forget the fighter Khabib Nurmagomedov was back in April 2014. Here's a reminder: The undefeated Dagestani lightweight had just out-grappled Rafael dos Anjos for three rounds, marking his sixth straight win in the UFC and cementing his status as a true threat with superlative takedowns and top control. The 155-pound title was so close he could practically get an underhook on it. Then Nurmagomedov's world changed, starting with the physical frame in which he lived. While prepping to face Donald Cerrone in September 2014, he tore his meniscus, a casualty of a calendar year in which a huge portion of the UFC roster wound up under the knife. 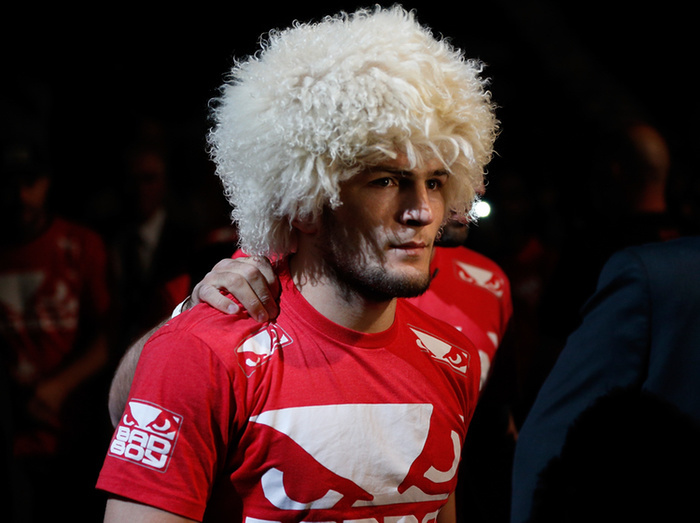 After rescheduling with Cerrone for spring 2015, Nurmagomedov bowed out with yet another knee injury. In October, it was trauma of a different species: a rib injury turned a Dec. 11 bout against Tony Ferguson into dust. Meanwhile, Nurmagmedov watched dos Anjos—the man he last beat—follow his own momentum to become the divisional overlord, the months since April 2014 encroached on years, and promises of a comeback continued to be broken by his body. And last week at an appearance at a Reebok-sponsored seminar in Moscow, Nurmagomedov spoke of another delay, this time from a self-imposed return date on the UFC's Superbowl Weekend card. "At that moment [a few weeks ago], I thought that everything would be easier," he told Sportbox.ru, as translated by Bloody Elbow. "Now I understand that February 6—this is early. I'm one hundred percent sure that there will not be a fight because I can see how hard it is to recover after a rib injury. So by the end of December I will be in good health. And in the beginning of January, I will proceed with hard training. I will not accept the fight before March." Yet if we take Nurmagomedov at his word—that his timeline for return is honest instead of overly optimistic, that another month off isn't a smokescreen for a more profound problem that he's rushing through—another delay could be good news in disguise. Recall that just over a month ago, this rib injury was the catalyst for The Eagle's hints of retirement at 27-years-old. Within weeks, he stepped back from that precipice and lobbied for the aforementioned return at UFC 196. And why not? When you're on pace to spend nearly two years on the sidelines while others make the strides your own body hasn't allowed, champing at the bit for a return is to be expected. In that light, Nurmagomedov deferring his return instead of rushing a recovery is a sign of self-awareness. The paradox in coming back from knee troubles, rib issues, and the other sorts of injuries that combative sports make common is that it demands the sort of temperance that a lifetime of competing doesn't reward. Rest, patience, going light—these aren't concepts that obsessive athletes always embrace, but they are entry-level demands when you beat back the symptoms of a buckling body. The rehabilitation process doesn't give the same endorphin release as rounds of shark bait, and the sessions don't typically end with your efforts pooling in a puddle on the mat. Progress comes painfully, slowly, and in increments. Even with that self-awareness, that's not to say that Nurmagomedov faces a clear path back to the Octagon—after all, he wasn't far out from another self-prolonged period of recovery for his knee when he damaged his rib. But considering he was nearly gone for good a few weeks ago, the difference between 22-month layoff and a 23-month layoff is hardly a difference at all.